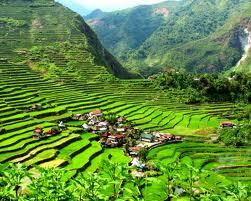 Banaue Rice Terraces was considered as “Eight Wonder of the World”. It was built over 2000 years ago by ancestors of the indigenous people with only primitive tools such as stones and woods. It is also declared a World Heritage Site by the UNESCO (United Nations Educational, Scientific and Cultural Organization) in the year 1995. The terraces are located approximately 1500 meters (5000 ft) above sea level and cover 10,360 square kilometers (about 4000 square miles) of mountainside, sophisticated irrigation system made from bamboo tubes coming from the rain-forest above the terraces. According to folklore, if the steps are put end to end it would encircle half the globe. The Terraces was located in the province of Ifugao, Philippines. Until today this wonderful creation still remains. For viewpoints have been made to provide breathtaking views. The higher you get the better the view of the Banaue Rice Terraces. 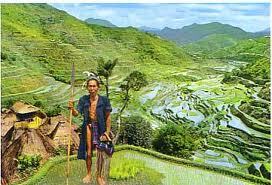 The best month to visit Banaue is June to August where the rice starts to grow and feel the aromatic smell of the opening of the rice grains. It is easy to go in Banaue. It takes 9 hour bus trip from Manila. Basically, Dangwa Transit has daily trips going to Banaue Rice Terraces. The terminals of the bus are located along Dimalasang St., Sampaloc, Manila and Aurora Boulevard, Cubao, Quezon City. You can contact them at telephone numbers +63-2-732-2879 and +63-2-410-1991. Alternatively, you can take the Auto Bus with Banaue Route. The terminal is at España Boulevard corner G. Tolentino St., Manila. The Auto Bus leaves Manila at 10 pm and arrives 7am. You can contact them at telephone number +63-2-735-8098. The travel will pass through the provinces of Bulacan, Nueva Ecija, Nueva Vizcaya then to Ifugao. Accommodation at Banaue is not a problem. If you want a cheap accommodation or luxurious hotels, you can find lot of hotels and Inns found in the town center. Uyami’s Greenview Lodge – the most popular hotel in town and you ca contact them at 074-386-40-21 and 0920-540-42-25. People’s Lodge and Restaurant 074-386-4014. Banaue Hotel 074-386-4087, their rooms are priced at P2500-P3200. Banaue View Inn 074-386-4078 sits on top of a mountain overlooking Banaue Rice Terraces and town with prices at P800-P900. Native Village Inn and Family Inn are additional options.